Millennials, now the largest age cohort in America, are different than prior generations in a number of ways. They are less likely to get married, for instance. 65% of present day 18-to-35-year-olds have never been married, compared to the 40% of young adults who had never said “I do” in 1980. Another key difference between millennials and prior generations is housing. Whereas in 1980 almost 44% of adults under age 35 owned their home, today that rate is just 35% (likely in part because millennials simply cannot afford to buy in many cities). Those differences have big implications for the taxes paid by millennial workers. For instance, the mortgage interest tax deduction is one of the largest sources of tax savings for many Americans, but millennials by and large do not benefit from it because they live in rentals. Likewise, working millennials are putting less toward tax-free retirement savings than prior generations (in part because they are putting more toward student loan payments). On the other hand, in most cities, millennials earn less than the median income. That means they face lower-than-average marginal tax rates on their federal taxes and in states (or cities) with progressive tax rates. We ran those income numbers through our income tax calculator, which incorporates federal, state and local income taxes. In making that income tax calculation we assumed that the typical millennial in each city will claim the standard deduction. We also assumed that she will file her taxes as a single filer, claiming one exemption (that is, she is unmarried and has no children). Lastly, since millennials have historically been unable to save sufficiently for retirement (though that may be changing), we assumed they did not make any pre-tax contributions to a retirement account. High incomes and high taxes in San Francisco. San Francisco has some of the highest taxes in the United States. 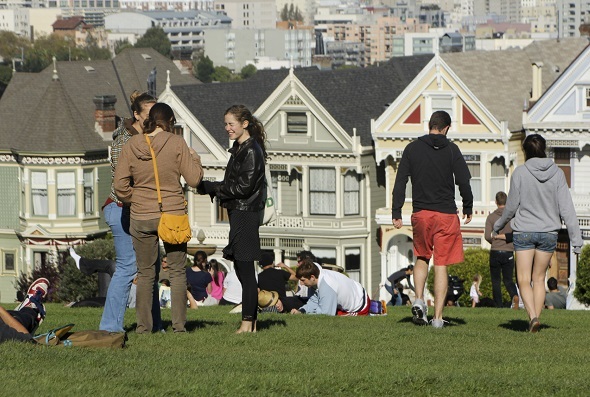 Millennials in San Francisco have the second-highest median income in the country. 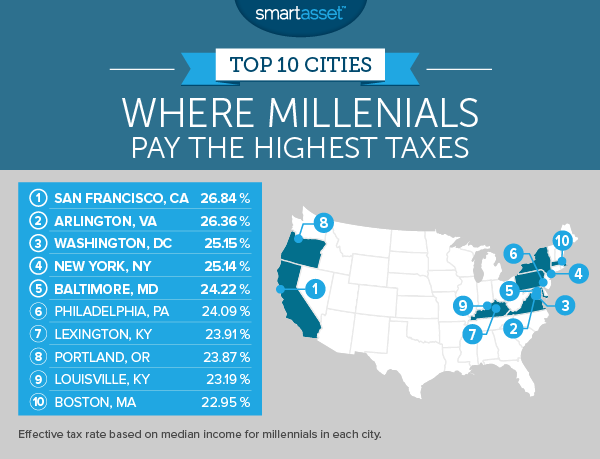 For both those reasons, San Francisco millennials pay higher taxes than those anywhere else in the U.S.
Kentucky city taxes hit millennials. Despite median income for millennials that is lower than the national average, two Kentucky cities rank among the places with the 10 highest taxes on millennials. Kentucky’s income tax structure means a state rate of 5.8% for the typical millennial, in addition to city rates of up to 2.75%. Lowest rates in Florida, Texas and Nevada. They do not have state or local income taxes. Millennials in these states pay effective income tax rates of less than 17%. In San Francisco, there are three levels of income taxes. First, there are the federal taxes paid by everyone in the U.S. We found that a San Francisco millennial earning median income will pay about $12,536 in federal income taxes. Next, there’s the California state income tax. Single filers earning between $51,530 and $263,222 pay a marginal tax rate of 9.3% in California, higher than the top marginal tax rate in all but two states. That results in another $2,562 in taxes from a typical millennial in San Francisco (based on the assumptions we outlined above). Lastly, San Francisco residents face a city income tax of 1.5%. The country’s wealthiest millennials live in Arlington. The median income among 18-to-34-year-olds in Arlington is $61,620, highest in the country. That means they also pay the highest federal income taxes. While the state income tax in Virginia is not quite as high as that of California, most taxpayers still pay a top marginal rate of 5.75%. For a millennial in Arlington earning median income, that adds up to over $3,040 in state taxes. Though the highest local marginal tax rate in Washington, D.C. is 8.95%, millennials earning the median income for their age group in the city will pay a lower rate. The top rate for workers with earnings between $40,000 and $60,000 annually is 7%. That is higher than the top rate in most states. Including federal taxes, we calculated that a median-income-earning millennial in D.C. will pay just over a quarter of total income in taxes. NYC is America’s largest city. It also has some of the country’s highest state and local taxes. Our analysis found that a millennial earning $43,678 (the average among the median income for millennials in the five boroughs) would pay an effective state and local tax rate of 7.18%. That is the second highest state and local rate in the U.S., behind only Lexington, Kentucky. The median income for millennials living in the city of Baltimore is $39,561, 14th highest among the country’s 100 largest cities. Yet, according to SmartAsset’s analysis, millennials in Baltimore pay higher tax rates than those in many areas with lower earnings for millennials. This is largely because of the city of Baltimore’s income tax. The city has a flat income tax of 3.20%, which pans out to the second-highest effective city rate in our study. 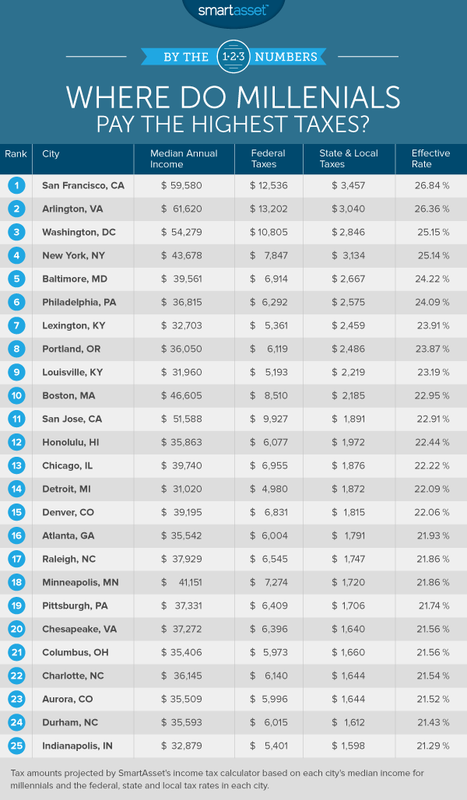 The only place with a higher city tax on millennials than Baltimore? That would be Philadelphia. Philly residents pay a flat city rate of 3.92%. Millennials in the City of Brotherly Love still manage to pay lower overall taxes than Baltimore because of the state of Pennsylvania’s relatively low 3.07% flat tax rate and because of slightly lower median earnings. The median income for millennials in Lexington is $32,703, according to the U.S. Census Bureau. That is lower than the average for the 100 largest U.S. cities. Nonetheless, those same millennials pay some of the highest tax rates, according to SmartAsset’s analysis. The city of Lexington has its own income tax of 2.75%, third highest among the cities in our study. Additionally, the Kentucky marginal rate on income between $8,000 and $75,000 is 5.8%. The state of Oregon has no sales tax, but it has some of the highest income taxes in the country. The top rate is 9.9%, but most filers will pay the slightly lower (but still high) marginal rate of 9%. For single filers, that applies to income between $8,400 and $125,000. Overall, including federal taxes, we found that a millennial earning median income in Portland would pay an effective tax rate of 23.9%. While not quite as high as the local income tax in Lexington, Louisville’s city income tax (which it calls an “occupational tax” of 2.2% still rates in the top 10 of all major U.S. cities. This 2.2% rate is withheld from paychecks. For a millennial earning the median income of $31,960 in Louisville, that adds up to $703.12 in annual taxes. Massachusetts has a flat income tax of 5.15%. That isn’t especially high as compared with the income taxes in other states. However, because millennials in Boston have relatively high earnings (the median for that age group is $46,605, sixth highest among the largest U.S. cities), they pay higher federal rates. Overall, we calculated an expected tax bill just over $10,700 for a millennial earning that median income in Boston.